It’s Aurochs Appreciation Week. Aurochs were the wild ancestors of today’s herd of 1.3 billion domesticated cattle. They were huge, strong, and fierce — the opposite of the passive cud-chewing manure makers of today. In regions having ideal conditions, bulls could grow up to 6 feet (180 cm) tall at the shoulder, and weigh up to 3,300 pounds (1,500 kg). Their horns were much longer than cattle, and pointed forward, aggressively. Some believe that the species emerged in India between 1.5 and 2 million years ago. They survived in a world along with similarly large, strong, and fierce predators. Eventually their range spanned from England to China. Aurochs’ preferred habitat was dense ancient forests with lakes, rivers, bogs, and fens. They didn’t hang out in frigid tundra regions with woolly mammoths. Some say Neanderthals emerged 600,000 years ago, and others say 350,000. They had migrated into Europe by 250,000 years ago, and went extinct around 30,000 years ago. During their long visit in Europe, Neanderthals hunted aurochs with wooden thrusting spears, but did not drive them to extinction. Mark White’s team wrote a fascinating paper on five ancient sites where Neanderthals had hunted steppe bison, aurochs, rhinoceros, horses, and reindeer. 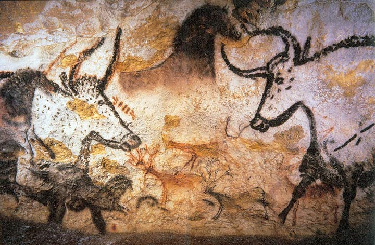 They discussed the La Borde site in France, where aurochs were driven into a collapsed cavern, a pit trap. In 1971, La Borde was discovered by chance, and largely destroyed, by a construction project. During rushed rescue excavations, the remains of 40 aurochs were found at the site, and far more were likely destroyed by the machines. Most of the animals were juveniles, and most adults were cows. Avoiding adult bulls was an intelligent way for hunters to avoid a premature death. Neanderthals combined their knowledge of aurochs behavior with their knowledge of the land’s topography, to select the prime location for a bloodbath, and then guide the animals into it. Their knowledge was more powerful than their weapons. This trap was used many times. Maybe 45,000 years ago, Homo sapiens arrived in Europe. Some are beginning to wonder if our visit on Earth will last as long as the Neanderthals. In France, aurochs were painted in the Lascaux cave 17,000 to 13,000 years ago, and carved on the walls of Caves de la Mairie 15,000 years ago. Aurochs disappeared on the Danish islands by 5500 B.C., from Britain by 1500 B.C., from the Netherlands by 400 B.C. They still survived in Germany when Julius Caesar visited around 50 B.C., to harass the Suevi and other wild tribes. Charles the Great, or Charlemagne (747 – 814), the first Roman emperor, once had a painful encounter while on a hunting trip. When an aurochs appeared in the forest, his hunting buddies fled in terror. Charlemagne was less intelligent. He rode up to one, drew his sword, and pissed off the monster, who gored his leg. From that day forward, the humbled king walked with a limp. In Russia and Hungary, aurochs were last seen in the twelfth and thirteenth centuries. In Germany, they had blinked out by the fifteenth century. Aurochs made their last stand in Poland. As agriculture expanded, Europe’s ancient forests and wetlands vanished. Grain farmers detested aurochs molesting their crops, and herders resented them dining on prime forage. Aurochs stood in the path of progress. Anton Schneeberger (1530 – 1581) was a Swiss botanist and doctor based in Poland. He once wrote a letter to Conrad Gesner, who included it in a book published in 1602. He wrote that aurochs had no fear of humans, and did not flee from their approach. When they were teased or hunted, they got very hot-tempered and dangerous, sometimes hurling idiots high into the air. 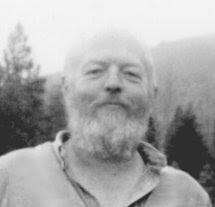 Cis van Vuure wrote the book on aurochs. He thought that domestication began about 9,000 years ago, in the Middle East and Pakistan. As the powerful intelligent gray wolf was reduced to the neurotic poodle, so the mighty aurochs was reduced to countless variations of dimwitted cattle, fine-tuned for specific climates and uses (meat, hides, milk, draught). It’s hard to imagine such notoriously fierce animals being forced into slavery. Dogs and horses were likely enslaved at multiple locations independently. Alasdair Wilkins wrote about recent DNA research on cattle. The ancestors of every cow in the world trace back to a tiny herd in the Middle East, a herd as small as 80 animals. The process of domestication may have taken a thousand years, and it was likely done by sedentary people. It would have been impossible for nomadic herders to confine huge powerful animals with a tremendous love of wildness and freedom. Meanwhile, back in Poland, the forests kept shrinking, as did the number of aurochs. Farmers and hunters kept killing them. Many likely fell to the devastating diseases of domesticated herds, like anthrax. People became concerned at their decline, and guards were hired to discourage poaching, but the rapidly growing civilization had no room for them. The last aurochs died in 1627, in the Jaktoróv forest, in Warsaw province of Poland. Thus, the steaming beef in a hamburger comes from the bovine equivalent of a poodle, an unhappy meal indeed. The aurochs were displaced from their vast territory, and eventually eliminated by heavily armed tropical primates. The unusual primates have displaced the wolves, grizzlies, rhinos, bison, cod, whales, the Hercynian forest, and on and on. Look at us. How have we been changed by this rampage? I raise my glass to wildness and freedom, and pray that the terrible hurricane soon loses its fury, and makes way for the dawn of a Great Healing. Caesar, Julius, The Gallic Wars, 50 B.C. Einhard, Vita Karoli Magni (Life of Charles the Great), A.D. 830. Gestner, Conrad, Historiae Animalium, Christoffel Froschower, Zurich, A.D. 1602. Pisa, Rustichello, The Travels of Marco Polo, A.D. 1330. Rimas, Andrew and Fraser, Evan D. G., Beef: The Untold Story of How Milk, Meat, and Muscle Shaped the World, Harper, New York, 2008. Van Vuure, Cis, Retracing the Aurochs: History, Morphology, and Ecology of an Extinct Wild Ox, Coronet Books, 2005. LINK to summary. White, Mark, Paul Pettitt, and Danielle Schreve, “Shoot First, Ask Questions Later: Interpretive Narratives of Neanderthal Hunting,” Quaternary Science Reviews, Volume 140, 15 May 2016, Pages 1-20. RIP, Aurochs. Thanks once again for the whirlwind tour! Didn't realize they survived in Poland until so recently.